Properties in Savigny-sur-Orge average 4.3 out of 5 stars. Property 2: Studio 15 min from RER C station of juvisy s / o and savigny n / a and 15 min of orly. 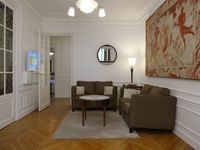 Paris 14eme - Very beautiful newly decorated designer apartment. Property 41: Paris 14eme - Very beautiful newly decorated designer apartment. We loved staying here and would easily come back. It's on a quiet street with easy access to food markets and restaurants. The modern, efficient apartment was perfectly sized for our family of 4. The beds were also very comfortable. Elisabeth, the owner, is very knowledgeable and helpful. Highly recommend.